If your directory supports nested groups, the directory may contain groups which are members of other groups. This page tells you how to remove a group's membership of another group. Note that removing a sub-group does not delete the group. Some user directories allow you to define a group as a member of another group. Groups in such a structure are called 'nested groups'. In Crowd, you can map any group to an application, including a group which contains other groups. Crowd supports nested groups for LDAP directory connectors, Crowd internal directories, Delegated Authentication directories and custom directories. You can enable or disable support for nested groups on each directory individually. For more information, refer to the documentation on configuring a directory. For more details about nested groups, refer to Nested Groups in Crowd. Click the 'Groups' tab in the top navigation bar. The Group Browser will appear. Select the directory in which you are interested, then click the 'Search' button to list all the groups that exist in that directory. 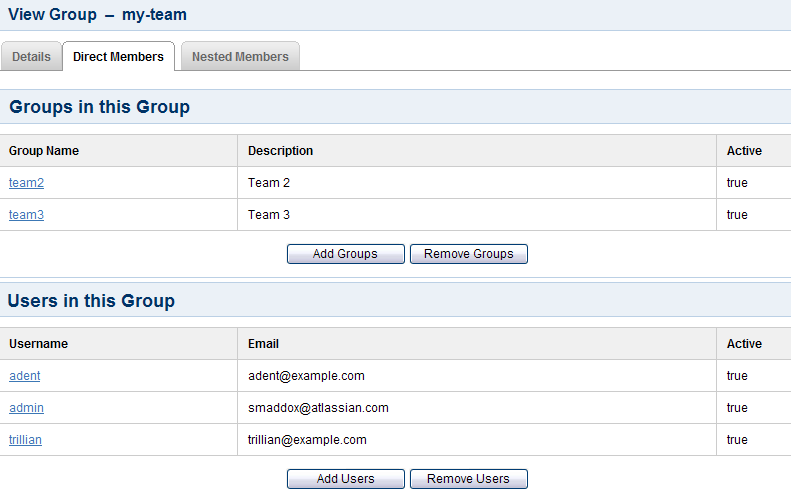 You can refine your search by specifying a 'Name' or by choosing 'Active' or 'Inactive' groups. Find the parent group in the list of groups and click the link on the group name to view the group details. The 'View Group — Details' screen will appear. Click the 'Direct Members' tab. This will display a list of the selected group's members, both the groups and the users that are direct members of the group. See the screenshot below. Click the 'Remove Groups' button. The 'Remove Groups' button will not appear if nested groups are not enabled for your directory. You can enable nested groups via the directory configuration screen. The 'Remove Groups' popup screen will appear, as shown below. Enter your search criteria in the 'Search' textbox. You can enter all or part of the group name. Leave the search box empty to match all group names. You can refine your search by choosing 'Active' or 'Inactive' groups. You can also set the 'Maximum Results', i.e. the number of groups to be retrieved. Click the 'Search' button. Crowd will list the groups in the selected directory that match your search criteria and are sub-groups of the selected group. Select the groups by putting a tick in the checkbox next to one or more group names. To select all groups, you can put a tick in the checkbox at the top of the table. Click the 'Remove Selected Groups' button to remove the selected sub-groups from the group.